There is some very sound advice for all of us in Paul’s letter to the Philippians. Just believing and putting into practice one verse alone (Ph. 4:8) would render us a great benefit. 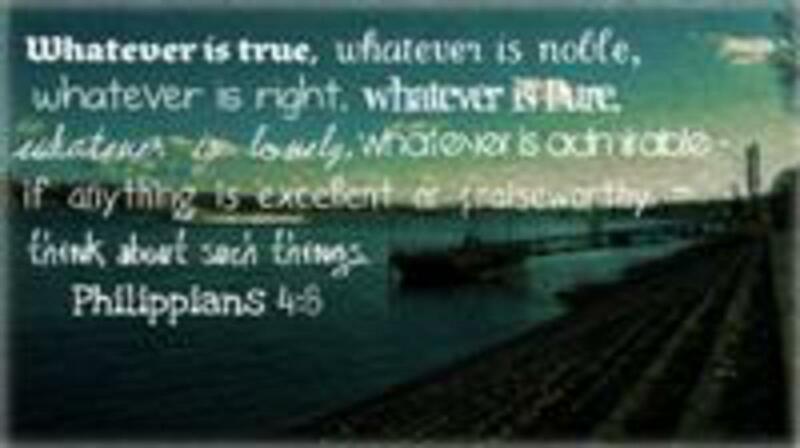 It reads: “Finally, brothers, whatever is true, whatever is noble, whatever is right, whatever is pure, whatever is lovely, whatever is admirable--if anything is excellent or praiseworthy--think about such things.” Having negative thoughts constantly can trouble our hearts and rob us of the joy and peace of God. How many times have we tossed and turned at night simply because we can’t stop thinking about a certain occurrence or situation in our lives? The irony of receiving this beneficial advice is that it was prompted by a not so pleasant occurrence. Reading the beginning of that chapter we will notice that there had been a very notable squabble in the Philippian church involving two prominent women by the name of Euodia and Syntyche. Paul pleaded with them to settle their differences, even asking that church’s leader to help them do it. It is no wonder, then, that Paul advised it’s church members to think only about good things, for the congregation would have suffered greatly had they not removed this troubling disagreement from their minds. Still, this advice holds true for all of us today. I’ve lost count of the many times I’ve counseled with folks who deal with disturbing thoughts on a daily basis. One reason folks can’t easily shake off negative thoughts is that they dwell on them instead of focusing on good things. Just as all of us have things that can bother us if we focus on them, we also have good ones that can cheer us up. Another thing that doesn’t help is inactivity. I’ve heard this saying from time to time; perhaps you have too: “An idle mind is the devil’s workshop.” When we occupy our time doing things or working on a project or seeking who and where we can help others, we won’t have time to be thinking about dumb things. Finally, if you still have problems with this issue, why not take it to Jesus? They don’t call Him the Prince of Peace for nothing. NOTE: Starting November 3, I will sent these meditational thoughts only to those who expressly request them. I myself, do not read all the devotionals or bible related items I receive on a regular basis, so I completely understand if others do not read mine. For those who have responded already, thank you very much.